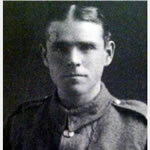 On 9 April 1917 near Arras, Sergeant Cator's platoon had suffered heavy casualties from a hostile machine-gun. Under heavy fire the sergeant, with one man, advanced across the open to attack the gun and when his companion was killed, he went on alone. Picking up a Lewis gun and some ammunition drums on his way, he succeeded in reaching the enemy trench and sighting another hostile machine-gun, he killed the entire team and the officer. He held the end of the trench with such effect that a bombing squad were able to capture 100 prisoners and five machine-guns. On 12th April 1927, he had become a Freemason, being initiated into the Wanderers Lodge in London. He was passed to the Second Degree on 11th October and was Raised on 8th November. On 6th May 1929, he became a Joining Member of the Naval and Military Lodge, meeting in Norwich, and served as Worshipful Master in 1944. He was appointed Provincial Grand Sword Bearer for the Province of Norfolk in 1949. He was also a prominent member of the British Legion and the Old Comrades' Association.